The annual Hohokam will take place all throughout today with much of Phoenix metropolitan area eager to play their hand against some of the best athletes and teams in the east valley. We took a quick rundown of the some of the top events to watch this evening at one of the biggest meets in the State. The distance events are always exciting at Hohokam, but this year the focus excitement will lean a little more towards the middle-distances. For starters, Leo Daschbach (Highland, Jr.) and Abi Archer (Chaparral, Sr.) are both entered in the boys' and girls' 1600 respectively. Last week they both ran State leads in the 3200 at Arcadia, which are nationally ranked among the top-ten. Daschbach has yet to run an elite level 1600m this season and Archer has not dipped under 5 minutes. Then, the Boys 800m will pit Highland twins Sam Green and Ernest Green (Juniors) against Alex Rafferty (So.) of the Millennium Tigers. Sam and Ernest finished third and eighth in the Open Boys' 800m with PRs that have them ranked 1st and 3rd in the State. Meanwhile, Rafferty hasn't run since Willie Williams and will be looking to give the Greens a run for their money. The Boys Hurdles races will reunite several athletes who raced the fastest heats at the Chandler Rotary. Koa Tuipala (Desert Edge, Sr.) edged out DeCarlos Brooks (Chandler, Sr.) the last time around and this could be the last time we see them race the Highs until State. 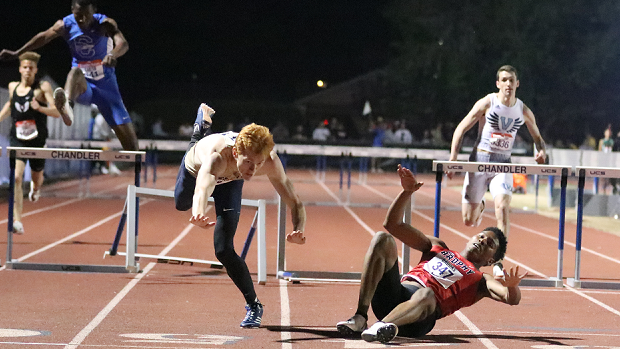 Then the Boys' Intermediate Hurdles will feature a rematch between Ethan Wright (Desert Vista, Sr.) and Elisha Brooks (Brophy College Preparatory, Sr.) who managed to stumble across the finish line in 1st and 2nd place at Chandler Rotary. Both Wright and Brooks likely hope to push each other well under 38-seconds. On the Girls' side, Mesa all-stars Rahni Turner (Westwood, So.) 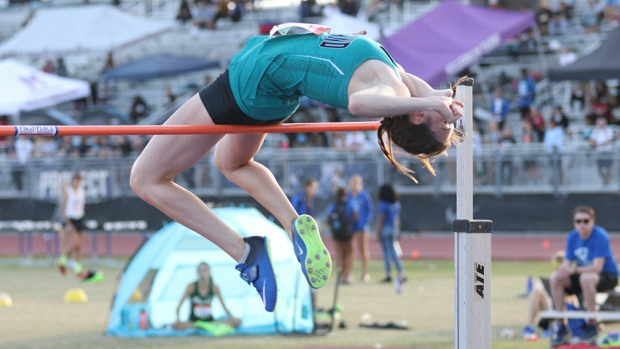 and Sarah Marske (Mesa Mountain View, Sr.) will look to climb a little higher on the State leaderboards in both hurdle races. Neya Jamison (Chaparral, Fr.) and Erykah Garrett (Chandler, So.) will also contend and are ranked with Turner and Marske among the top ten low hurdlers in the State. The Girs' Long Jump, has Queen Creek Senior Myreanna Bebe ready to face Centennial Junior Rylee Perkins. Bebe is tied for the top ranking in the State thanks to her 18-6 mark from the Ron Smith Classic while Perkins holds a lifetime best of 18-10.5 from last year, albeit a wind-aided mark. (Empire, Sr.) and Connor Ivie (Basha, Sr.) are the top entries in the Boys' Long Jump contest. More specifically, Smith and Ivie are each ranked 2nd in the State for the Long Jump and the Triple Jump, respectively. This season, Smith reached a lifetime best of 23-feet at the Husky Classic while Ivie cleared 46-feet at the Chandler Rotary last month. Malik Whitaker (Hamilton, Sr.) and Cierra Tidwell (Highland, Sr.) are ranked at the top of the leaderboard for the boys' and girls' high jump contests respectively and will contend as the overwhelming favorites. Likewise, Tim Ellis (Valley Vista, Sr.) and Eden Henderson (Chaparral, Sr.) will look to reach greater heights in the Pole Vault. Chandler's Ciera Jackson (Jr.) and Makayla Hunter (Jr.) are ranked 1st and 2nd in the State for the among the Girls' Discus but will contend to secure the victories in both of the rotational throws. Makiya Moore (Queen Creek, Sr.) should also factor into the mix as well. Last season, Moore was a State Champion in the D2 Girls' Discus. Since then, she transferred from Arcadia High School to Queen Creek High School. Meanwhile, Alaina Diggs (Millennium, Sr.) has been working her way back into top shot-put form over the past month. Last year, Diggs was a State Champion in the D1 Girls' Shot-Put and this year she's thrown a season-best of 43-9, which ranks her no. 1 in the State. Desert Vista will have Jorden Morales (Jr.) contending for victory in the Discus, Youssef Koudssi (Sr.) looking to take the Shot, and Kevin Fairchild (Sr.) aiming to extend his season best, as the meet favorite in the Javelin. Morales is currently the State leader in the Discus thanks to his 179-4 toss at Chandler Rotary. and Youssef Koudssi, as the top two Boys' Shot-Put throwers in the State. Finally, we come to relays which will likely come down to the Chandler, Desert Vista, and Hamilton all separated by less than two seconds. 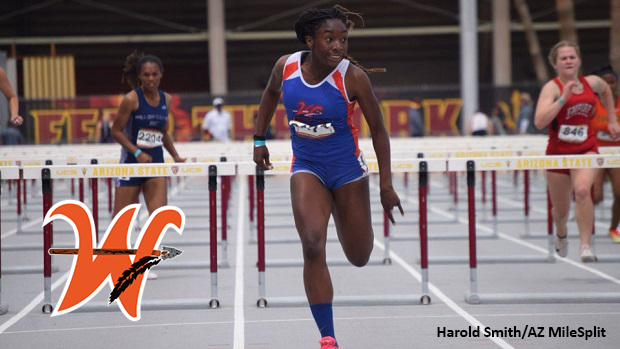 Last week, Chandler ran a State-leading mark of 3:20.38 at the Sun Angel Classic. Desert Vista and Hamilton finished 2nd and 4th in that race and are ranked 3rd and 5th in the State. Could we see a sub-3:20 performance in the Boys' 4x400 at Westwood High School tonight? Finally, the Chandler girls are entered with Jocelyn Johnson and Trinity Henderson, two freshman members of their State Record 4x400 relay, and Morgan Foster. Foster hasn't raced since Rotary due to a small hip issue and she's been taking things light to avoid any risk of injury. If all things go well, we shall see what kind of shape she's in tomorrow. At Brophy AMDG, Chandler blew the doors wide open with an unprecedented 3:43 clocking to close out the night. Could we see something similar from the wolfpack tomorrow night?